We left Rachdamnone Road and just strolled through the surroundings. 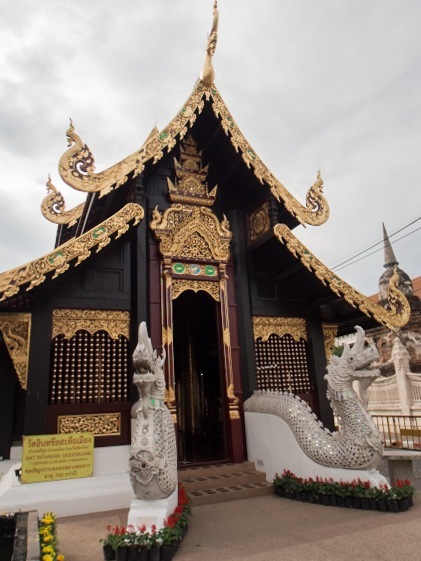 At 111 Moon Muang Road we found Wat Dok Kham, another small temple. 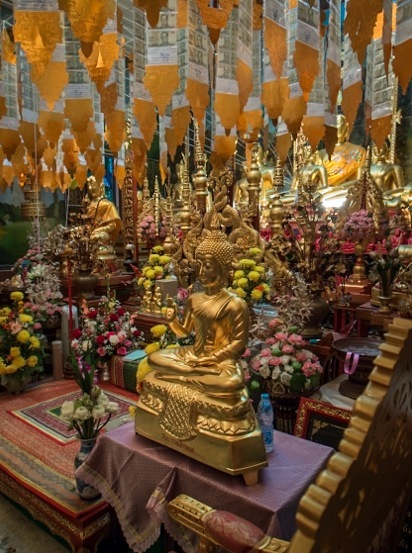 Again, it is a Buddhist temple, with lots of statues and decorations. It’s small and there is not much to see. So we continue walking around, until we reach Wat Inthakin Sadue Muang. It is a brand-new temple, just being built. 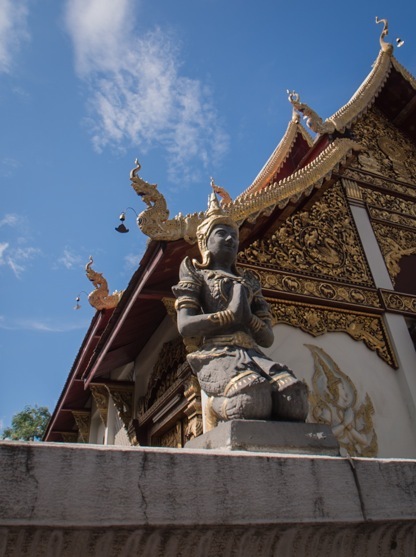 It is famous for ancient Buddha images, specifically Luang Phor Khao, which it now houses. This temple was once the location of the city pillar, known as Sao Inthakhin (hence the name). The old temple was abandoned, as was the city during the Burmese occupation in 1775. It has now been rebuilt. 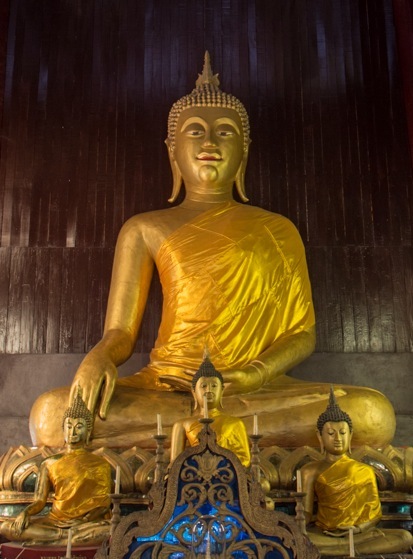 This big Buddha below sits in the Wat Phan Tao temple, which was built over 150 years ago. Wat Phan Tao means “The Monastery of a Thousand Kilns”. This is probably due to the fact that the site was used for the casting of Buddha images intended for Wat Chedi Luang, which is adjacent to the monastery. This Wat is different in that it has a hall made out of dark teak wood. 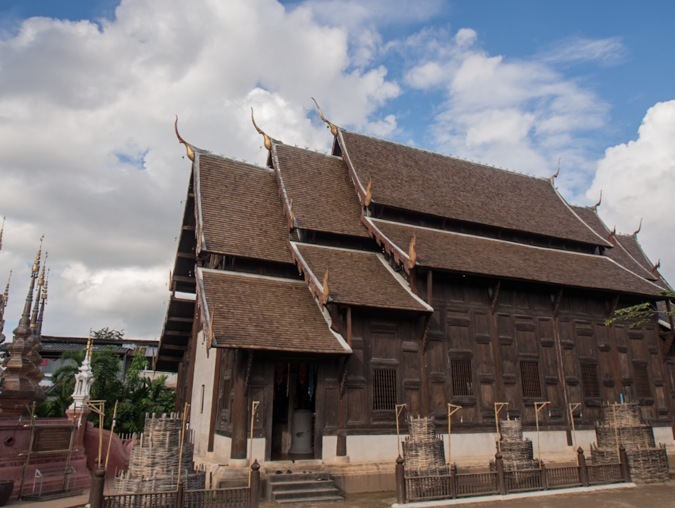 That’s because it was originally the palace of Chiang Mai’s king, Chao Mahawong, who ruled from 1846 to 1854. 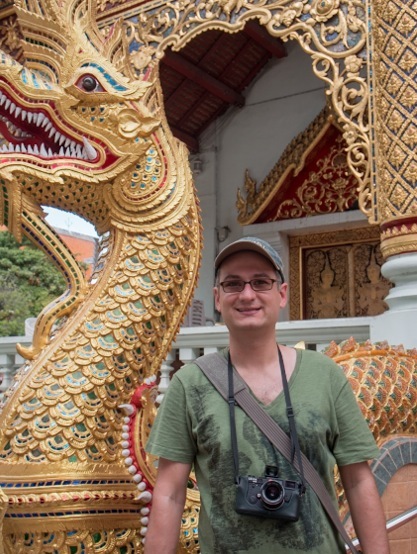 It looks different to a normal monastery, it has carvings of central Thai style, which are gilded and inlaid with coloured glass. Apparently some traces of Chao Mahawong’s habitation can still be seen; for example, the front gable end is decorated with the image of a peacock standing over a sleeping dog. 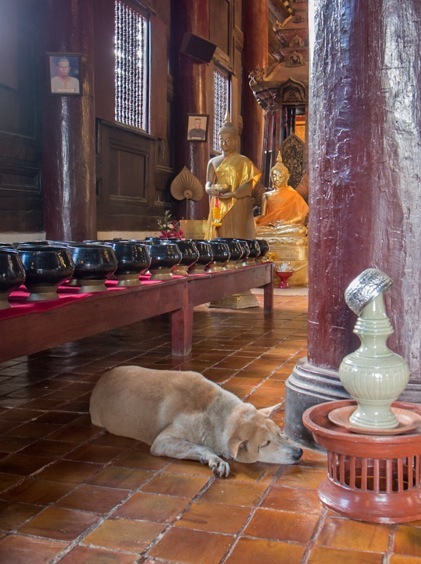 Funnily enough, I missed this – but I took a picture of a sleeping dog inside the temple, so hopefully this makes up for it! Interestingly, almost every temple we passed had a Naga statue at its entrance. They were all elaborately decorated and made for a great photo opportunity! 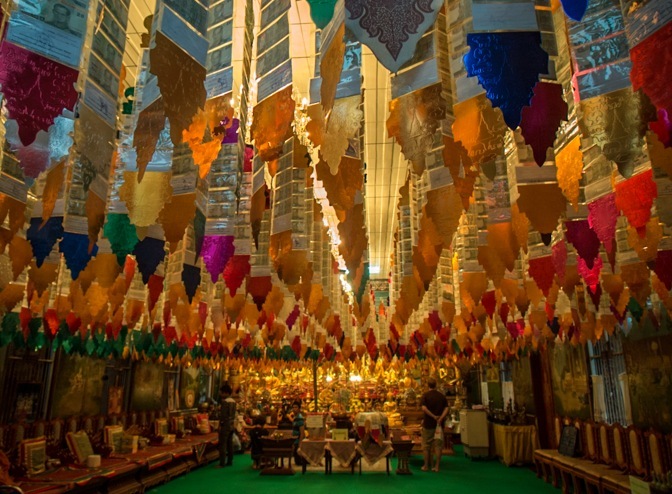 One of the temples we visited was elaborately decorated – with bank notes. They were hung up on the ceiling, in colourful folders. I’ve been trying to find out more about this temple, but I did not write down the name. It was somewhere along Tha Pae Road, after the Chang Klang Road crossing, towards the river. The temple grounds were not that interesting, it was more like a few buildings scattered around a parking place – but the inside of the temple was so nice, with all the money decorations. Great colours everywhere. 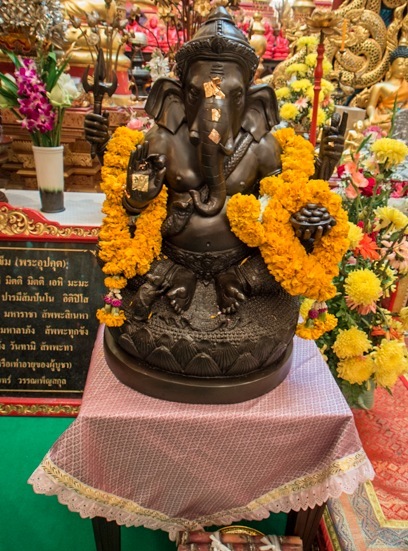 And also a small Ganesha statue, covered with some gold.